The US venture capital company, Verdant Frontiers, established Verde Beef in 2014 with 100 hectares of land provided by the Oromia regional government in Adami Tulu, within the Batu (Zeway) area. The farm has since been expanded to 1,300 ha, and holds around 5,000 cattle. Africa-focused private equity firm 8 Miles has picked up “a significant minority stake” in Ethiopian agribusiness Verde Beef Processing. Verde Beef is a producer of premium beef primarily for the domestic market but has recently started exporting its goods. 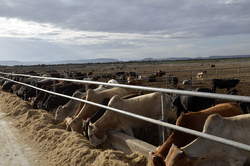 The company, which is currently operating a 1,300 ha feedlot and crop-farming facility in Adami Tulusouth of the capital city of Addis Ababa, plans a substantial expansion in the future with 8 Miles’ backing. Verde Beef aims at growing its current base of 6,000 animals tenfold, taking advantage of the increasing demand in the markets in the Middle East, Africa and Asia. Next year, the company will launch construction of its own abattoir and meat processing facility.